A delightful 4 * cottage with charm. Enjoy the warm welcome, tranquillity, interesting wildlife and the dramatic countryside with its rich heritage. Relax and unwind in this enchanting cottage, steeped in history. Enjoy the warm welcome, the peace and tranquility, dramatic countryside and remarkable wildlife, and even gaze at the stars without the distraction of light pollution. Wake up to a stunning view of the open moorland from your bed. 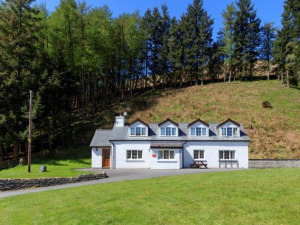 Esgair Wen is beautifully situated overlooking the Ystwyth Valley on a 800 hectare sheep farm-- Tyllwyd, between the Elan valley and Devil's Bridge. EXcellent bird watching area Children welcome from any age. Details upon request or visit web-site.